I have a client with obesity and challenges with blood sugar control. She has bursitis, among other challenges, and also has struggled repeatedly with calcium oxalate kidney stones, and she seems to believe that laparoscopic surgery is the only way to deal with them. I know that’s not true…I am helping her with overall dietary changes (e.g. increasing veggies and whole grains), but I’m not sure how to help her specifically with the kidney stones remedy and preventing recurrence. She struggles with sleep as well because of physical pain. She is very eager and motivated to get better. What would you recommend for people with recurrent kidney stones and who want to lose weight? One of the organs most vulnerable to inflammation from chronically-elevated blood sugar (as we often see in obesity) is the pair of kidneys. Reduced kidney filtration capability can cause minerals to build up, precipitate out of urine, and eventually form stones. Especially given the obesity, the key tenet for both of this client’s goals is eliminating sugar and sweeteners and also reducing refined and concentrated carbohydrates. I would be careful with encouraging too many whole grains – only small servings (~1/2 cup at a time) as a substitute for refined flour-based foods. Depending on her tolerance for carbohydrates, grains may need to be removed entirely, at least for a time during the reversal of insulin resistance. Learn more about kidney stones here. Most kidney stones are indeed of the calcium oxalate variety (~80%), but it’s important to realize that kidney stones can be made of other substances as well. There are several key tenets for the elimination or prevention of these kidney stones. Depending on the client’s unique situation, I definitely disagree that surgery is a must; I have had many clients get rid of them naturally without surgery. Hydration is critical to prevent mineral build-up in the kidneys. In my experience, this is the MOST important lifestyle choice for avoiding stones. Though each person’s needs are unique, for this individual with this predisposition, make sure your client is drinking at least 8 glasses (or 2- 3 water bottles worth) of water each day, interspersed throughout the day in between meals. This should be plain, clean water. This will also help with any excessive eating due to thirst and feeling well-hydrated prior to meals. For stone prevention in one who is prone to them, I recommend they squeeze the juice of an entire 1/2 of a fresh lemon into a glass of water at least twice daily. The high citric acid content will bind with the calcium for easier excretion and prevent it from precipitating out into crystals (which is what forms the stones). For people who suspect existing kidney stones, I recommend the juice of four whole organic lemons daily, spread throughout their glasses of water. For people unwilling or unable to do this, mineral citrate supplements are necessary. Magnesium is critical for ensuring calcium is effectively utilized in the body. I recommend at least 300mg twice daily on a full stomach. Ideally check RBC magnesium labwork and aim to keep it in the upper third of the reference range. If constipation is present, use the citrate form (which is a great win for breaking down the oxalate); otherwise, use glycinate, malate, or a “multi-chelate” version. Vitamin K2 is critical to ensuring that calcium from food/supplements is taken up into bone vs. ending up in circulation and being excreted from the kidneys. Unless the client is on a blood-thinner (e.g. coumadin), I recommend at least 90mg Vitamin K2 of the MK-7 variety with a meal daily (blends of the MK-4 and MK-7 form are fine as well). For active stones, I would take this dose 2-3x daily. Individuals with recurrent kidney stones often have high urinary calcium excretion (but often optimal, normal serum calcium). Potassium. As long as she is not on a potassium-sparing medication (e.g. certain diuretics prescribed for hypertension), I recommend 100-200mg of potassium citrate twice a day (in this case, a double win because the citrate form will help in the same way that the citric acid in the lemon juice does – above – and will also help to optimize urine pH). Ensure Vitamin D3 supplementation is not excessive. Especially until you can implement these other supportive items for a month or so at a minimum, be cautious about keeping Vitamin D supplement doses too high which will draw more calcium into the body. Vitamin D also uses magnesium to convert to its final active form, and this puts an extra burden on available, sufficient magnesium, as above. Avoid all black tea. Which contains substantial amounts of oxalate (and is quite easy to consume in large amounts). Yes, there is high oxalate content in many other foods too (e.g. chard, beet greens) which can contribute to the problem, but generally we want to work to support the body in managing well and benefiting from these high-nutrient foods. Unless stone recurrence is common after implementing all these suggestions, I don’t believe that ongoing, long-term avoidance of these other healthy foods is necessary. It is key to educate your client that iced tea is not a substitute for plain, clean water. I personally have had *several* clients develop kidney stones simply as a consequence of suddenly adding high daily intake of iced tea (black) to their diet. Interestingly, here’s a published medical case study demonstrating the same: http://www.nejm.org/doi/full/10.1056/NEJMc1414481 . Especially for women (given conventional medicine’s typical love of recommending high-dose calcium supplements to them), reduce calcium supplements for the moment IF daily intake is more than ~300mg/day and, importantly, divide the doses. Make sure that any calcium supplements are not of the carbonate or oxide variety which may be poorly absorbed in bone tissue. When resuming, assuming there is an overt need due to significant osteopenia, limit consumption to ~700mg/day maximum and of a well-absorbed form such as citrate or MCHC. Contrary to myths otherwise, continuing to consume calcium via food (e.g. dark leafy greens, tahini, nuts) or the moderate-dose supplements can actually be helpful in binding oxalate in the gut (and preventing high oxalate absorption into the systemic body and exacerbating kidney stone growth). With active stones, it is indeed prudent to avoid high oxalate foods during the triage and healing process (e.g. rhubarb, spinach, swiss chard, beet greens). Just to reiterate – getting rid of all sweeteners and refined carbohydrates and addressing insulin resistance is vital! Not only does high blood sugar inflame the kidneys but it can also increase urinary calcium, adding more flame to the fire for potential stone enlargement/addition. High blood sugar can also increase blood levels of uric acid which decreases oxalate solubility and encourages precipitation via stones. Make sure there is adequate, ongoing intake of B vitamins. You mentioned bursitis in passing, which I find is often relieved by returning Vitamin B12 status to normal (studied as far back as the 190s). We also need ample, ongoing levels of activated Vitamin B6 (which is *not* the kind included in the vast majority of supplements and assumes individuals well make the conversion from pyridoxine to P5P; as usual, some do and some don’t). Vitamin B6 is particularly key for glutathione synthesis, oxalate metabolism, and nerve health (neuropathy is common in those with chronic hyperglycemia such as Type 2 diabetics). I would recommend a good-quality daily B-complex either on its own (e.g. Thorne’s “Basic B”) or as part of a multivitamin formula to reverse insulin resistance (e.g. Designs for Health’s “Metabolic Synergy”). But of course, we don’t want to stop at triage or rapid relief. We want to get to the root cause and reverse it to prevent recurrence! This is a clinical write up which will be of interest for further exploring the biochemistry at play. Chronic dehydration is common. Sub-clinical prediabetes is common. Sluggish bile flow is common. Moderate oxidative stress (from myriad sources) is common – especially because of our poor intake of nutrient-dense foods that would promote adequate, ongoing synthesis of endogenous antioxidants, especially glutathione! Perhaps surprisingly to you, I also recommend putting focus on individuals who have had their gallbladders removed, who have brewing congestion in the bile duct system (perhaps look for high or very high/normal alkaline phosphatase), or who have had various types of gastric bypass surgery. Practitioners are often curious about the role of urinary pH in kidney stone formation. Balanced urine pH is key to avoiding stone formation in those who are otherwise predisposed to these challenges. Calcium oxalate can precipitate out and form crystals at any urinary pH level if the concentration is strong enough, but pH >6.5 encourages this type of crystallization into stones. On the other hand, an overly acidic urine can encourage uric acid stone formation. The classic “old fashioned” remedy of using cranberry juice to prevent calcium oxalate kidney stones has been shown to be effective but not due to overt effects on urinary pH. And especially under circumstances such as this case, it’s important that this be low-sugar cranberry juice and used as a future preventive vs. a eradication therapy. 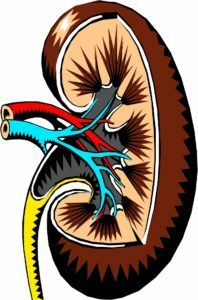 For a more entrenched, recurrence case, I have also had a couple of clients use Dr. Schulze’s “Kidney Cleanse” to get rid of their kidney stones, and in neither case have they recurred after more than three years post-remedy. This is a rather intense five-day cleanse, so it’s not suitable for all clients. But pain can be a powerful motivator! Obviously an ongoing focus on hydration and key nutrients (as above) is key and was implemented in both of these cases. For ongoing stone recurrence, Dr. Schulze’s “K-B Formula” twice daily is quite effective as a preventive. For individuals with more challenging chronic, recurring kidney stone challenges, you might consider chanca piedra. There is some (admittedly little) formal research into the use of this herb to relieve kidney stones, but there is a significant amount of experiential evidence of its effectiveness. I had used it quite successfully with a handful of clients with this challenge. You might find this helpful. For recurring kidney stones, I also recommend checking health of the parathyroid gland. See if your client’s serum calcium level (part of a Complete Metabolic Panel – or CMP) has been in the high 9s or 10s (assuming she’s at least 30 years old). If so, your client can request that her parathyroid hormone (PTH) levels be measured at the same time as serum calcium again. If serum calcium is high-ish, then PTH should be quite low in the reference range. If PTH is high in the range or clinically high alongside a high-ish serum calcium, there may be PTH dysfunction promoting calcification issues in the body. I have a client with a very similar profile. Also wheelchair bound and has only one kidney. Chronic urinary tract infections as well as antibiotic resistance. They can’t do surgery to remove stones because they can’t get rid of the chronic infection. Would these recommendations be similar for someone like this? Indeed, that’s a rough combination! Yes, I would. However, be very cautious about the amount of potassium or magnesium supplementation given the overall limitation in clearance capability. I would focus on heavy intake of fresh lemon juice instead. I have had two clients be able to use Thorne’s UriStatin, along with large amount of the lemon water, a B-complex with ample P5P, and between-meal proteolytic enzymes (e.g. Biotics Intenzyme Forte (double dose, 3x daily, empty stomach) to stop a chronic cycle of UTIs and kidney stones. A key part of this is also to evaluate if ongoing bile support of perhaps merited; given the implied, chronic use of antibiotics, some level of dysbiosis/SIBO seems highly likely which can impair bile secretion/emptying.